Over $100,000 of quality upgrades in this gorgeous Positano home! Quiet & peaceful premium location backs up to open space with views of the valley. Built in 2014, it features 5 bedrooms, 4 1/2 baths with 3,974 square feet of spacious living on a generous 7,624 sq ft lot. 1 bedroom & 1.5 baths are on main level. Gourmet chefâs kitchen with granite slab countertops, beautiful tile backsplash, large island with seating/storage, butlerâs pantry with walk-in storage, SS appliances, and the casual dining area, the large family room and covered patio area make for effortless entertaining. Upstairs includes a master suite, junior suite, and two bedrooms with shared bathroom between. Other features include formal living and dining rooms, beautiful hardwood floors, iron spindle staircase, upstairs laundry, and huge patios areas, with view, and playground in the professionally finished low maintenance yard. 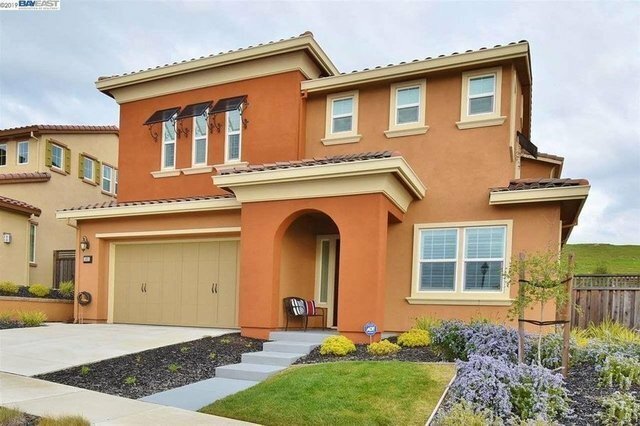 Top rated schools, close to SF outlets/shopping/restaurants & close to BART, 580/680.